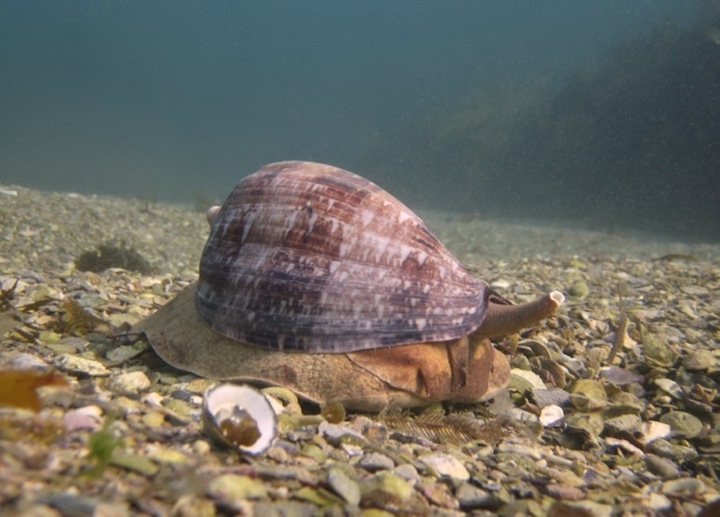 This animal is Cymbiola magnifica, another well-named mollusc. It’s a Volute. I come across them every now and then in the water off Sydney, moving in a stately way across the sea floor. 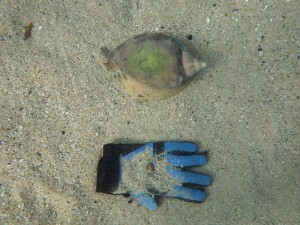 They are big – the shell can be about 8 inches long. As they proceed they track and probe with a long proboscis held out front. Within the molluscs, volutes are gastropods, like nudibranchs. 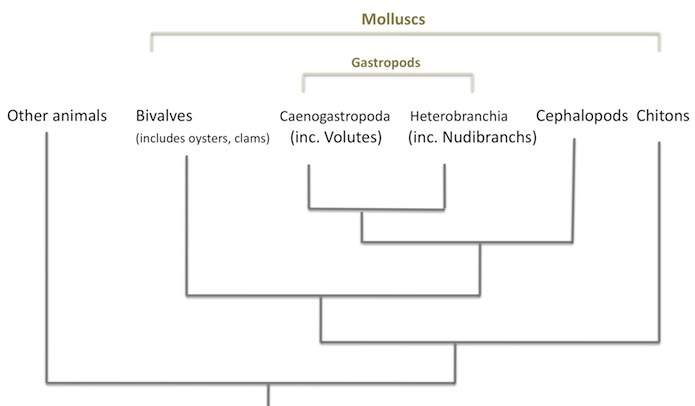 It seems there is flux afoot in gastropod classification, but of two of the most diverse groups of gastropods, nudibranchs are in one while volutes are in another. Though they look like snails, Volutes are not in the same group as the familiar land snails, which are more closely related to nudibranchs. This group, I understand, has two sexes, unlike the nudibranchs which are hermaphroditic. I have some shots of a volute mating – an unusual sight – but I’ll put those in another post. The shot to the right gives a sense of scale. I’ve often wondered about their lifestyle. 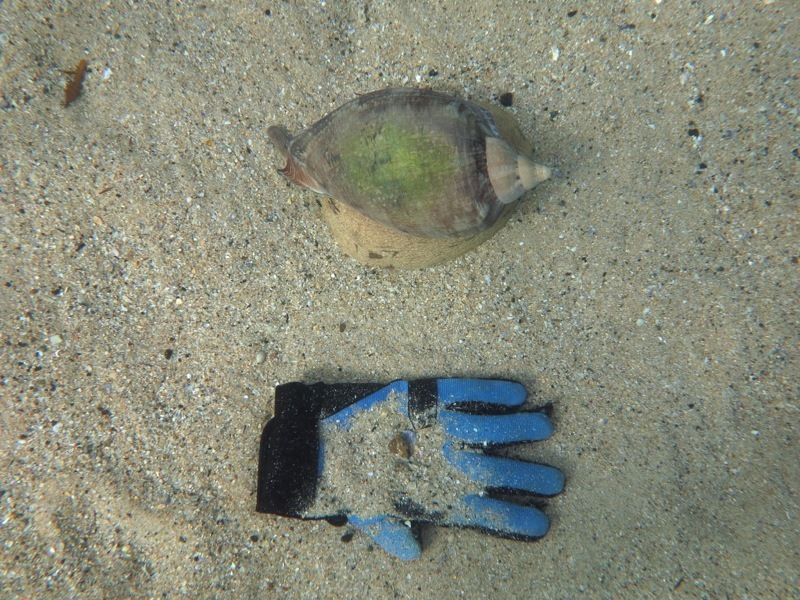 They seem to just appear from time to time in one of my usual dive sites, and I had no idea where they came from. Do they migrate slowly in from deeper water? Do they have a den somewhere? Why don’t I ever see small ones? Back in June I saw how some of it works. 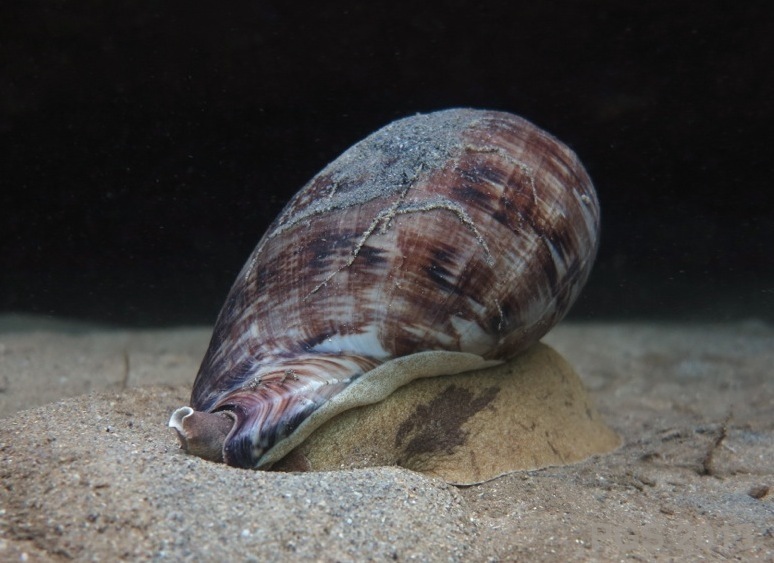 I think they burrow into the sand for much of the time, and lie there invisible, before emerging. In June I came across the last stage of an emergence of the one pictured at the top. I assume they emerge to feed (and as we’ll see, to mate), and then re-enter the sea floor. I’ve been trying to work out what they can sense. I assume the long proboscis can smell/taste the water, detecting traces of chemicals, and it is also sensitive to touch. But can they see at all? When they approach obstacles, they don’t divert their course, in any obvious way, before reaching the object. But this is not very informative, as they can climb steadily over or round anything medium-sized in front of them; they might see the objects and not care. I’ve not yet seen one encounter anything it couldn’t take in its amorphous stride. I planted my camera motionless before one, coming from some distance away, and it didn’t divert before reaching the camera and starting to climb round it. Volutes always look like some of the calmest animals in the sea.